Phil Esposito has a vivid memory of the night he played against Gordie Howe for the first time. "I'll never forget it," he told me recently. "It was my first game in the NHL. Well, my second one actually, because I sat on the bench throughout my first game, which was against Montreal at the Forum. I almost got to play in that game. With two minutes to play we (Chicago) were losin' 7-2. Coach Billy Reay looks down the bench and yells, 'Esposito, get out there'!" "Well, I was disappointed I hadn't taken a single shift, so I shouted, 'Okay, Coach, do you want me to win it or tie it'?" "He yelled back, 'Sit down, (bleep)'." 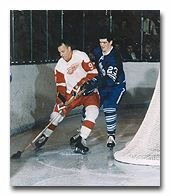 "Two nights later we're in Detroit, and who do I find myself standin' next to when I get on the ice but Gordie Howe. Geez, he was my boyhood hero. I'm lookin' at Gordie Howe. What am I doin' out here?" 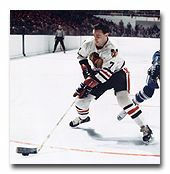 "Just before we're ready to face off, Bobby Hull yells at me, 'Watch that old (bleep, bleep, bleep)'! 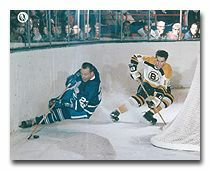 With that Gordie blinks once or twice and gets a little grin on his face, and that's when the puck is dropped. I'm still lookin' at him, thinkin' this is unbelievable, when bam! he gives me an elbow in the mouth." "I stagger back and say, 'Why, you old (bleep), you'! Then I spear him a good one and we both get penalties." "In those days, in the penalty box, the players sat close together with a cop or an usher or somebody in between them. So I'm sittin' there holdin' a towel to my split lip and I'm real upset with big Howe. Without thinking, I lean across the guy between us and say to Gordie, 'To think you used to be my bleepin' idol'." "Howe snarls back, 'What did you say, rookie'?" "Quickly I say, 'Nothin, Mr. Howe, not a word'." "To this day, I'll never forget that look." Forward Bill Sutherland was forced to become a gatecrasher and bull his way into the arena for the home opener of the Philadelphia Flyers the night they made their NHL debut. It was early in October 1968, and Sutherland was eager to suit up for the Flyers' first game in their new home - the Spectrum. What a surprise when he arrived at the rink! Nobody knew him and nobody would let him in. "But I'm playing tonight," he protested. "I'm a Flyer." "Prove it," the man attending the gate snapped. When Sutherland couldn't produce anything to show he was on the Flyer payroll, he was told to get lost. "Nobody gets in without a ticket" the man at the gate said. When the attendant turned to look after some of the paying fans, Sutherland dashed through the gate and ran down the corridor to the Philadelphia dressing room. An hour later, when he skated out to face the Pittsburgh Penguins, he vowed to do something that night to make the fans - and gate attendants - remember him. Early in the third period he scored the only goal of the game to give the Flyers a 1-0 victory. Some time ago I was in Hamilton at a sports banquet and Eddie Shack was one of the guest speakers. He entertained the crowd with some of the following stories. "I always spent the beginning of the year in the minors. With Imlach, if you misbehaved you were sent to the minors for a couple of weeks. So I was always going down. It was absolutely hell playing for Imlach. The lines were Keon, Armstrong and Duff. Then it was Kelly, Mahovlich and Nevin. Then it was Olmstead, Stewart and somebody else. After that it was always Shack and Harris and whoever the hell wants to play with them. That was Imlach. I didn't score many goals because I was always sitting on the bench. If I squawked, Imlach would say 'For (bleep) sake, (keep quiet), Shack, or it will cost you ten bucks for a ticket to get in and watch the game'. Even so, the game of hockey has been great for me. I got to play with so many clubs. My little wifey - she's such a sweet little thing - told me we could make more damn money on our real estate deals moving from city to city than we could from hockey. She used to say, 'Shackie, you better act up again and tick somebody off so we can get the hell out of here'. Hockey is fabulous. When I was with the Leafs and we were playing Montreal we always anticipated a scrap or two. In some of those games I always picked on their smallest guy - like Henri Richard�(back then) the rule was the third man is thrown out of the game. That was a great deal for me, especially with (tough man John) Ferguson always hanging around. (After my fight with Richard) Ferguson is shouting nasty things at me. I'm praying for a tie score because I know if one side grabs a big lead, Imlach is going to be saying, 'All right, Shack and Harris and whoever the hell wants to go out there with them'." Granted the next piece of lore takes place in the 1970's, but hey, it's a good one. "I had a real problem with Cheevers in practice. He simply would not try to stop shots and this invariably ruined our scrimmages. To remedy that I called a meeting of the players, minus Cheevers, and said, 'During the scrimmage, if you can hit Cheevers' goalie pads, we'll count it as a goal'. After three practices Cheevers came to me and said, 'Geez Grapes, have you noticed how great I have been playing in practice lately'? When some wise guy told him the truth, he was absolutely furious."